After 20 years of complaints, thousands gathered in Thoothukudi district in March, 2018 asking for the smelter to be shut down. Police killed 13 demonstrators in May 2018. In May 22, 2018 as people protested against the Vedanta-owned Sterlite copper plant, the police opened fire on a rally which marked the 100th day of demonstrations. The following day another person died from being hit by a rubber bullet, taking the death toll up to 13. Dozens of people were wounded. The government of Tamil Nadu then asked for a definitive closure of the plant; while welcoming the order, protestors said they need a cabinet decision on this or the company will move court to get a stay. (6). This massacre became word news.(4). (5). (7). (8). The background to current events is a follows. The ‘Anti-Sterlite People’s Committee’ protested against the company Sterlite Industries (India) Limited since March 2013. The factory belongs to the company Vedanta Group. On 23rd March 2013, many people from neighbourhood areas fell sick following noxious gas leak (1). It is common knowledge that sulphur dioxide is a byproduct of smelting. The effluent is toxic for a number of reasons. Following the protest, Tamil Nadu Pollution Control Board issued a notice directing the Vedanta group company to close the plant. The conflict continues today (2018). Seven years before March 2013, in 1996, the copper smelter had begun operations in Tuticorin, Tamil Nadu (Newsclick, 2018; Foil Vedanta, 2018). Protests against the plant began almost immediately, with hundreds of fishermen blockading the port with their boats, in order to prevent the ships carrying copper ore from unloading in March and October of 1996. However, this did not prevent operations. In July 1997, 165 women in a neighboring factory—Ramesh Flowers, fainted as a result of a toxic gas leak from the plant. Some of these women later had miscarriages (Foil Vedanta, 2018). Since then—over a period of more than two decades—villagers and local residents have been protesting against noxious sulphur dioxide leaks and bad effluent management (The News Minute, 2018). In March of 2013, another major gas leakage had occurred at the plant. This lead to renewed protests in which over 5000 people participated, a bandh (strike) was called and the town was shut down for several days (Foil Vedanta, 2018). At the time, according to the Tamil Nadu Pollution Control Board a sensor in the smelter’s smokestack showed sulphur dioxide levels were more than double the permitted concentration at the time (Leotaud, Mining.com, 2018). This resulted in temporary shutdown of operations of the plant. However, the Supreme Court of India eventually permitted the plant to restart operations under the condition of a payment of INR 100 crore (~15 million USD at the time), to compensate for polluting the surrounding land and water sources it has caused since 1997 and, for running the smelter without various environmental clearances for a few years (Leotaud, Mining.com, 2018; Foil Vedanta, 2018). In September 2017, the National Green Tribunal found that the Sterlite plant responsible for dumping copper slag in the Upper Odai river and causing the blockade of the river stream. The judgment also revealed that the plant operated without authorisation under the Hazardous Wastes (Management, Handling and Transboundary Movement) Rules, 2008, between 2013 and 2017 and ordered to compensate the affected villagers for the pollution it had caused (Newsclick, 2018). Since then, although occasional resistance has been ongoing, the announcement for expansion of the plant has recently drawn public anger (Newsclick, 2018). The plant is currently set to expand operations to double the smelter's capacity from 400kt to 800kt pa. within the next 24 months. In corporate statements, Vedanta-Sterlite states that this expansion will make the Tuticorin smelter, “one of the world’s largest single-location copper smelting complexes” (Leotaud, 2018). Protests have re-emerged since residents called for an indefinite dharna (protest) and hunger strike on 12th February 2018. It is reported that, initially (in February), villagers had petitioned the district collector several times seeking closure of the unit, but no action had been taken. Eventually, after top district officials failed to reach an understanding, around 250 people began an indefinite fast (The Indian Express, 2018). Eventually, over 500 people, including many women and schoolchildren, blocked the company gates until they were rounded up and arrested on 14th February. 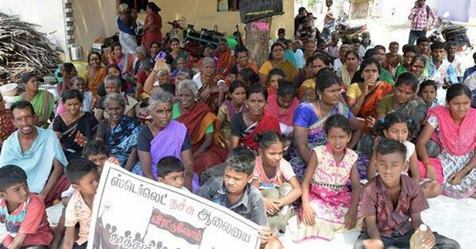 Since then, protests have been ongoing day and night, especially in the villages surrounding the plant which are worst affected (Foil Vedanta, 2018), such as the Kumarattiyapuram village (Scroll.in, 2018). As of 24th of March, 2018, the movement escalated with over 15,000 participants demanding not only the halt of any further expansion of the project, but also calling for a shutdown of existing operations (The News Minute, 2018; Newsclick, 2018; Foil Vedanta, 2018; Scroll.in., 2018; The Hindu, 2018). Alleging pollution of air, water and soil, the protesters say the plant should not be allowed to expand its operations. The plant is located beside the fragile Gulf of Mannar, where toxic waste has damaged fish populations and the livelihood of thousands of fishermen (Foil Vedanta, 2018). “There are lot of environmental dangers as well as health dangers, particularly cancer. Almost every house is affected by cancer. Children are most affected. Throat cancer has increased. Eye cancer has also gone up”, Fathima Babu of of the Anti Killer Sterlite People's Movement was reported as saying (The News Minute, 2018). Women and children of the village squatted under a tree with a black board demanding the closure of the plant. Black flags were put up in some houses in the village, making their view of the copper smelter unit clear (The Hindu, 2018). 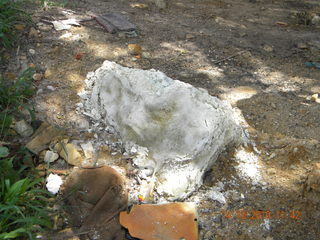 Shanthi, a young mother, said, "The factory has caused enough damage to the environment. It's proven in court. The government should not renew its licence after the 25 year period" (Stalin, 2018). Meanwhile, a number of Tamil people held a protest outside the home of Vedanta Group chief Anil Agarwal in Mayfair, London, in solidarity with the protesters in Tamil Nadu. 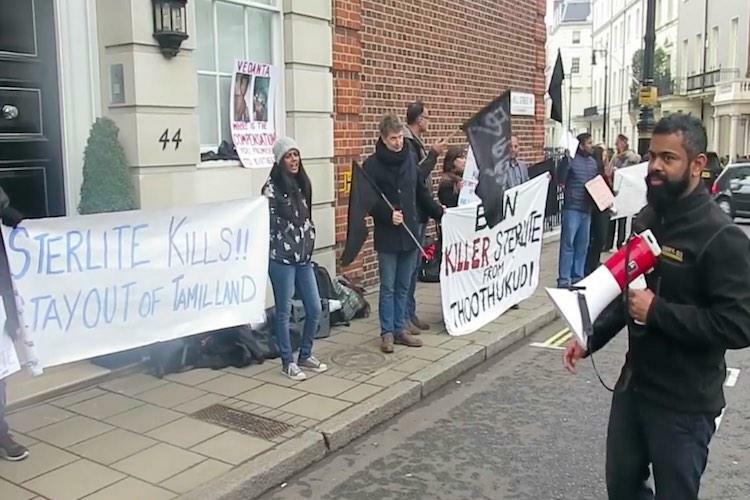 The protest in London was organised by Foil Vedanta, Tamil People in UK and Parai - Voice of Freedom (Newsclick, 2018; Foil Vedanta, 2018). British Tamils armed with traditional Parai drums shouted slogans, “Kekudha Kekudha, Tamizhar kural kekudha?” (Can you hear? Can you hear? the voice of the Tamils? )” on the streets of London (Foil Vedanta, 2018; Sekhar, 2018). The protest is ongoing (The Hindu, 2018). On 26 March 2018, the political party DMK asked the Tamil Nadu government to order Sterlite Industries to shut down its unit inTuticorin district if it continued to pollute the area. The party's working president M K Stalin urged the government to protect the people in the district from the pollution caused by the company's copper smelter plant. In a statement he said, "Sterlite Industries is polluting the Thamirabarani river as well as soil, making it difficult for the farmers to cultivate crops. The DMK will support the protests of the local people against the company." Health was affected and many of them were not able to breathe properly. Some of them suffered skin problems. (3). Project Details Vedanta's 400 ktpa brown field copper smelter expansion project at Tuticorin in India, together with an associated 160 MW (2x 80 MW) captive power plant, to be expanded after 2018 to 800 ktpa (800 thousand tons per annum). Relevant government actors Tamil Nadu Pollution Control Board , District Collector, Ministry of Environment & Forests (MoEF) and the chairperson of the Supreme Court Monitoring Committee. Other Pollution with sulphur dioxide. Other Respiratory illnesses. Alleged increased cancer rates. On April 2, 2013, the Supreme Court of India asked Sterlite Industries to pay Rs 100 crore as compensation for polluting the environment. The Supreme court has also directed that the amount is to be paid over three months from that day to the District Collector of Tuticorin. The situation is bound to change after the massacre of 22 May 2018. Development of Alternatives In 2013 it was reperted that a team of experts from IIT Madras and the Tamil Nadu Pollution Control Board officials have begun inspecting the copper smelter unit of Sterlite Industries on a direction from the National Green Tribunal following an alleged noxious leak last month, causing health problems among locals. However, later on and until 2018 the smelter operated, and the current protest (2018) is caused by the plans of expansion. Why? Explain briefly. Tamil Nadu Pollution Control Board issued a notice directing the Vedanta group company to close the plant. Sterlite Industries moved the National Green Tribunal on April 1 , 2013, challenging the order, saying it had been passed without giving an opportunity to them. The company was fined. But in 2018 is planning to double its operation. Hence the current complaints (2018), and the massacre of 22 May 2018. The outcome is still uncertain. The plant might be definitively closed down. The Wire. The Story Behind The Anti-Sterlite Protest. A backgrounder about the unit and its parent company Vedanta Resources and the how the plant breached human and environmental rights. The Hindu. 26th March, 2018. Thoothukudi villagers continue protest against Sterlite plant expansion. Scroll.in, 25th March, 2018. Tamil Nadu: Thousands protest against Sterlite Copper’s plan to expand its plant in Thoothukudi. The Indian Express, 26th March, 2018. 'Ban Sterlite': Thousands of protesters hit the streets demanding closure of copper plant in Thoothukudi. The News Minute, March 24th, 2018. 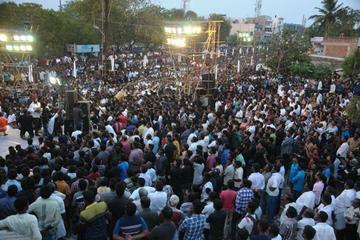 Thousands Come Out to Protest Sterlite Copper Plant in Thoothukudi. Treize manifestants ont été tués par la police à Tuticorin, dans le sud du pays. Ils protestaient contre la réouverture et l’extension d’une fonderie de cuivre accusée de polluer l’air et les nappes phréatiques. (7)VIDEO: Policía india usa rifles de asalto para dispersar protestas que dejan ya más de diez muertos . 24 may 2018. Las manifestaciones contra una planta minera a la que acusan de contaminar el aire y las fuentes de agua locales tienen lugar en una ciudad al sur la India . Stalin, J. S. D., 25th March, 2018. Thousands Protest In Tamil Nadu's Tuticorin Against Sterlite Copper Plant. NDTV. (3) Sterlite polluting Thamirabarani river shut it down: Stalin. Mar 27, 2018. Sekhar, A. 25th March, 2018. 'Can you hear the voice of Tamils?’: Sterlite protests outside Vedanta founder’s house in UK. The News Minute. Newsclick. 26th March, 2018. Thousands Unite Against Vedanta’s Sterlite Copper Plant In TN’s Thoothukudi. Foil Vedanta. 24th March, 2018. London and Tuticorin mass rally to ban Sterlite. Livemint, 27 March 2018. Tamil Nadu: Protests against copper plant in Thoothukudi intensify. As traders’ associations join the stir demanding the closure of a copper smelting factory, shops remain closed in Thoothukudi in a 24-hour shutdown. Other Comments One of the most engaged social activist and part of the Anti-Sterlite People Struggle Committee is the journalist Nityanand Jayaraman.